Learning just a handful of SPSS system settings allows you to get better results faster. This tutorial quickly walks you through the five most useful ones. We recommend you follow along with the examples by downloading and opening employees.sav. 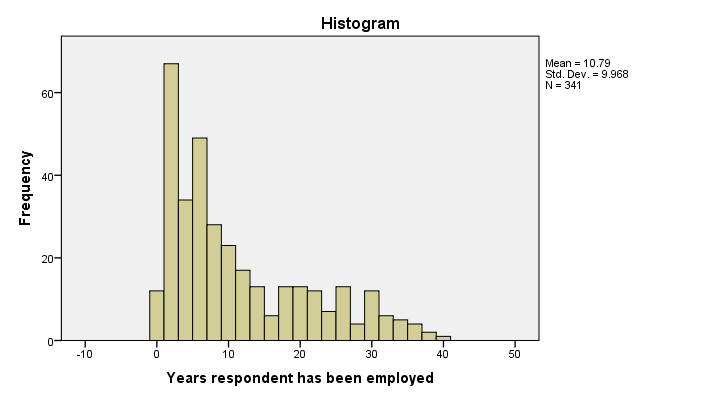 SPSS TNUMBERS determine how data values are displayed. In SPSS, tnumbers (short for “table numbers”) refer to how values are displayed in pivot tables: 1) as values, 2) as value labels or 3) as both. The syntax below demonstrates these three options. Setting tnumbers is mainly relevant for the FREQUENCIES, CROSSTABS and MEANS commands. Unlabelled values in your data are always shown as values, regardless of this setting. *1. Show only values in tables (rarely used). *2. Show only value labels in tables (reporting). *3. Show values and value labels in tables (data exploration and editing). SPSS TVARS determine how variables are displayed in pivot tables. In SPSS, tvars (short for “table variables”) determines how variables are shown in pivot tables: 1) as variable names, 2) as variable labels or 3) both. The syntax below demonstrates these options. Setting tvars is mostly important for DESCRIPTIVES, CORRELATIONS and many other commands. Whatever the setting, unlabelled variables are always shown as names. *1. Show only variable names (rarely used). *2. Show only variable labels (reporting). *3. Show variable names and labels (data exploration and editing). 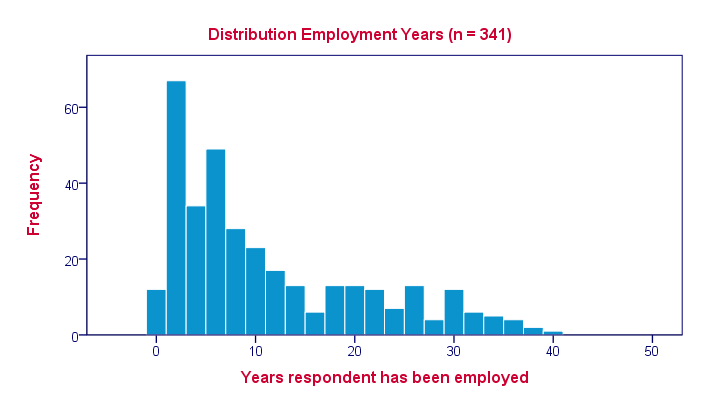 Now let's say we'd like to see a histogram of the years that our respondents have been working for this company. The simplest way for generating it is running frequencies years/format notable/histogram. The default result is shown below. If you feel this chart looks good, feel free to continue reading at PRINTBACK. If you'd like a prettier chart, the way to go is setting a ctemplate, short for SPSS chart template. For a histogram, you can download (and save) one here. A solid way for using it is copying the file to your project folder and setting the latter as your default directory. Now you can easily apply it by running set ctemplate ... as shown in the syntax below. *2. Set chart template. Make sure file is located in default directory. *4. Switch off chart template for subsequent charts. Setting printback on results in SPSS printing all syntax you run to your output window. If you run commands directly from the menu (which we don't recommend), then the underlying syntax is also printed back. As a first example, let's try the syntax below. *1. Print all subsequent syntax to output window. *2. Note how command below appears in output window upon running it. A shortcoming of SPSS is that the syntax it generates is often way more complicated than necessary. This interferes with learning syntax. For a dreadful example, let's change one setting by using the menu: we'll navigate to Edit Options Output. Next, follow the screenshot below. As we see, SPSS just printed an awful lot of syntax to our output window. However, what we just did in the menu corresponds to running simply set tnumbers labels. Although this is present in the syntax that SPSS just generated, the rest of it does nothing whatsoever. This is not helpful at all for learning how to get things done fast. We stop printing our syntax to the output window by running set printback off. The last SPSS system setting we'd like to discuss relates to SPSS tablelooks. Let's generate a basic descriptives table by running descriptives years. We find this table not very pretty. For a nicer looking table, you can download (and save) a table template here and copy it into your project folder. You can now activate it by runing set tlook ... as shown below. Due to a (suspected) bug, SPSS ignores your default directory in this case so you need to use the full path here. *1. Set table template and include folder where file is located in path. *3. Switch off table template for subsequent output. Last but not least, you can view all of your system settings (and more) by using SPSS’ SHOW command. So after running set ctemplate 'histogram-standard.sgt'. you can confirm that this chart template is in effect by running show ctemplate. Finally, readers who really, really want to know all system settings (many of which you'll probably never use) may run show all. Some other statistical software packages (e.g. SAS, R, and STATA) because most of the tasks can be accomplished through a drop down menus & dialogue boxes, which makes SPSS very user-friendly. Many programs required a serious learning curve that involves learning a new programming language, or syntax, in order to perform commands. New Value section of the variables you just created in the next module, so keeps this dataset handy.